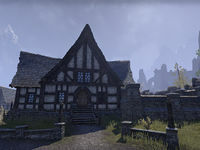 Two floors, no waiting, in this handsome walled town house makes for prime real estate in the quaint Rivenspire town of Fell's Run. The local story that the ravens that loiter around the front steps are the revenant spirits of former owners is absurd. Ravenhurst is a medium player house in Fell's Run. It features two floors and two entrances to the house. A third door leads to a courtyard and a small stable attached to the back of the house. 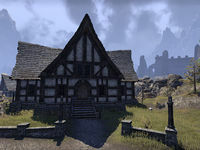 This house replaced an inaccessible, unnamed house in Update 12.